Quote from the movie Babe: "But no sooner do l become indispensable than they bring in a machine to do the job"
In my last entry I have been explaining why I'd prefer not to use a tool to generate Customized QR Codes. Not much sooner I got an inquiry if it was possible to make a customized QR code with a branding signature that could be reused. I offer this service as the Re-Use option that is explained on my website. To make one code with a minimal number of copies with different links is still something that can be done, but what if the number of copies could run into the hundreds, thousand, tens of thousands? At that stage a tool to make these copies would be the better alternative. I have been looking for ways to setup this service for some time now, and quickly found out that if I wanted to offer this service, it needs to be available 24/7. Since I cannot guarantee that I am available 24/7, the tool needs to be an online tool. The first version of this tool can now be found at kangaderoo.pythonanywhere.com. I already used the python programming language for the automated tasks of making an error free Custom QR Code. 'Python anywhere' is an online service that combines part of these tools with a web-interface. Use the demo account to see the tool in action. 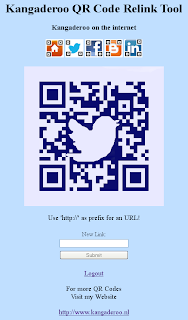 This account generates a copy of the displayed Twitter QR Code, where the content in the code can be to your specifications. If you require this kind of service, where you need a branded qr-code with multiple copies, please contact me for the possibilities.